The Hermon Hawks celebrate their victory in the Class B state cheerleading championship Saturday afternoon at the Augusta Civic Center. 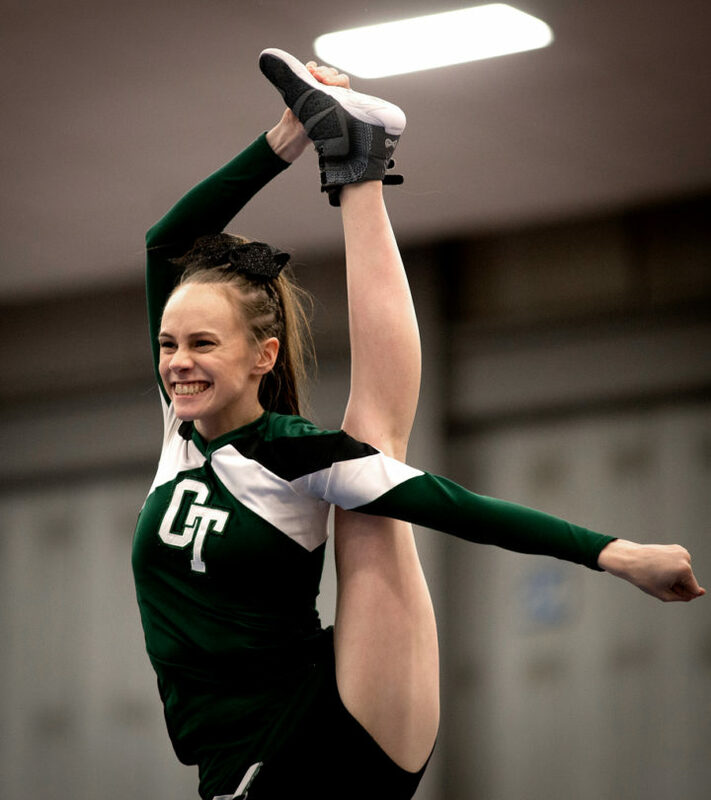 AUGUSTA, Maine — Maintaining a dynasty in any high school sport involves coping with the virtually constant turnover that graduation brings each year. That places a heavy onus on the coaches for leadership, but also on the more veteran performers on a given team. A youthful Hermon team with seven sophomores and six freshmen battled through the disappointment of a loss at its regional competition two weeks ago to return to the top at the Augusta Civic Center on Saturday. The Hawks captured their third consecutive Class B state championship and the program’s eighth in the last nine years. Old Town performs their routine in the class B state championship competition on Saturday at the Augusta Civic Center. “We just focused a lot more, pushed ourselves hard the last two weeks and got super hyped up for this and cheered our hearts out,” said Hermon senior Mercedes Davis. Hermon totaled 86 points to defeat North region champion Ellsworth, which finished second with 82.8 points, Eight-time defending South region champion Medomak Valley of Waldoboro (78.5), Old Town (74.1) and Leavitt of Turner Center (74) rounded out the top five. Other teams in the 12-school field were Presque Isle (69.4), Gray-New Gloucester (58.6), Spruce Mountain of Jay (57.9), Morse of Bath (57), Mount Desert Island of Bar Harbor (52.9), Freeport (52.5) and John Bapst of Bangor (46.5). “We hadn’t hit our routine all season so that was really our goal, to come out here and do what we knew we could do,” said Hermon coach Kristie Reed. “I’m proud of the kids. We had a little bit of difficulty but we just had kids who wanted it. John Bapst performs their routine during the class B state cheerleading competition on Saturday at the Augusta Civic Center. Davis, classmates Olivia Nash and Hannah Morin, and junior Brooklyn Brown were the lone upperclassmen on a Hermon roster that, while hardened by previous championship experience, was still sometimes subject to the inconsistencies of youth during the winter. The Hermon Hawks perform their first place routine in the class B state championship competition on Saturday at the Augusta Civic Center. Members of the state champion Hermon squad were Davis, Nash, Morin, Brown, Alanna Berube, Jasmine Boulier, Ella Campbell, Kailey Curry, Cali Cyr, Madison Despault, Hailey Gogan, Madison Higgins, Kristen Lusignan, Riley Perry, Alexis Raymond, Caitlinn Whitehouse and Torria Wittmer. Competing for Ellsworth were Tanner Hardison, Emma Whitney, Bailey Peterson, Abigail Bland, Anna Brown, Chenell Campbell, Brooke Carver, Allison Dorr, Laura Jude, Jada Kairys, Ellie Kane, Alexis Rossi, Paige Sawyer and Kerrigan Shorey. Gardiner Area High School (North) and Spruce Mountain (South) were awarded the MPA sportsmanship banners for Class B cheering. The Hermon Hawks perform their routine in the class B state championship competition on Saturday at the Augusta Civic Center.